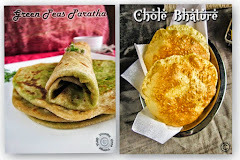 Hi friends, dosas are all time favorite especially ghee roast, masala dosa, onion dosa in that order rava dosa also takes place. 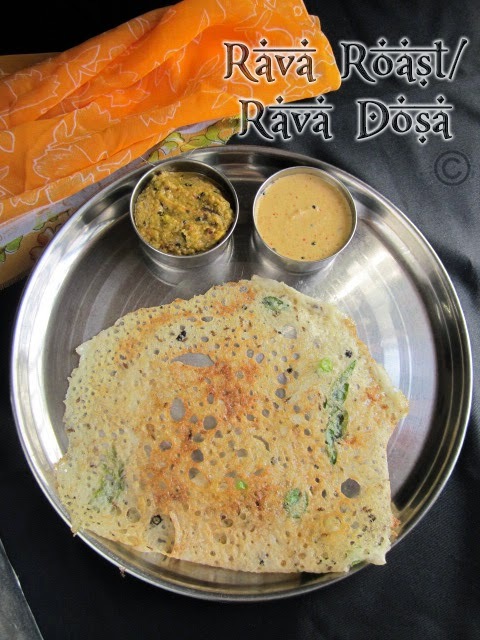 My first priority to masala dosa and second one is rava dosa. 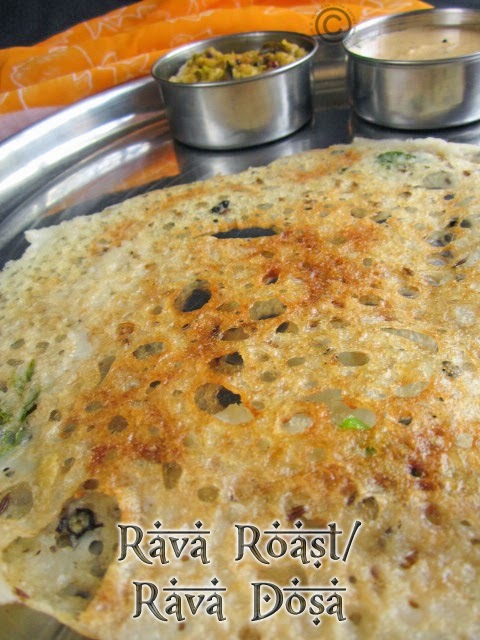 I love crispy rava dosa much and we used to get the crispy rava dosa in nearby Brahmin hotel, but nowadays the taste is not likely and moreover the hotel is not running now. 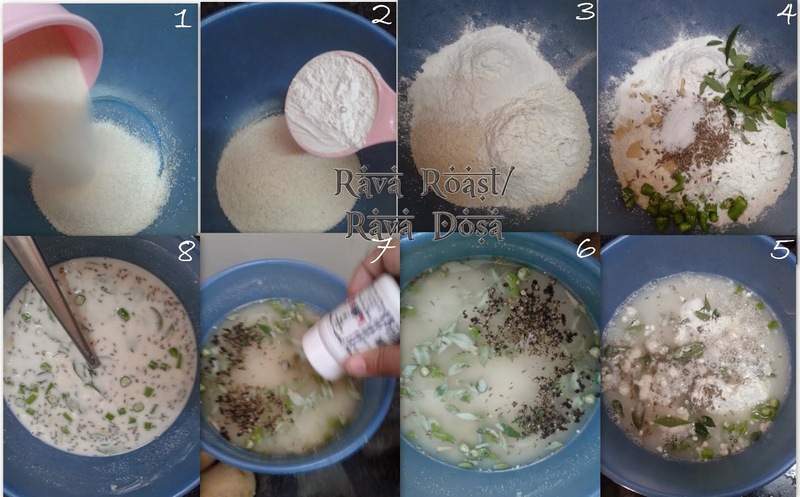 Take wide mixing bowls add rava, maida and rice flour. Following by add all other ingredients except oil and mix it well after adding water without any lumps. Keep it in rest for 1 hour. Now mix it well and it will be thicken now, add little water to get thin batter. Heat dosa tawa on high flame, drizzle some water and you will hear hizzz sound now keep the flame on medium. 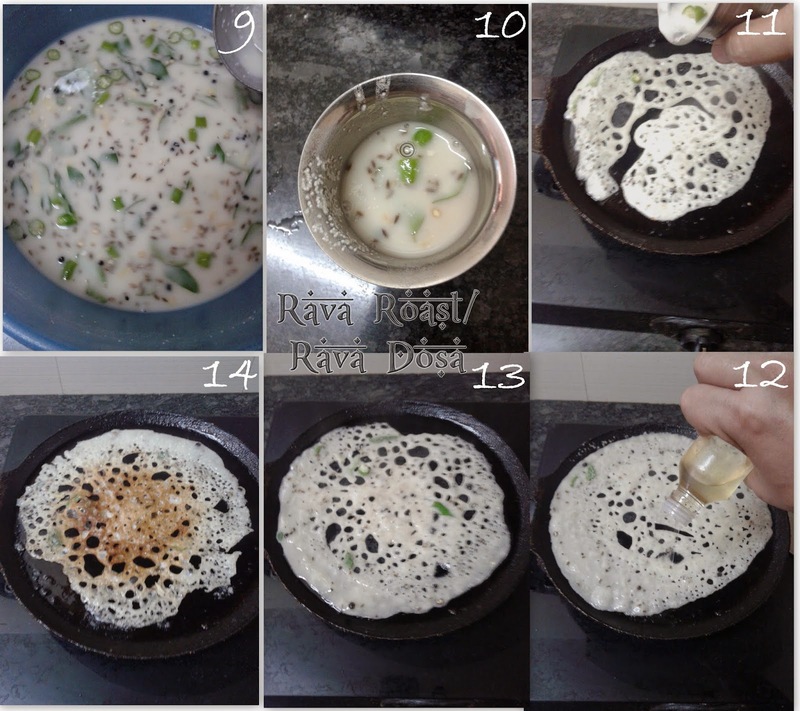 Stir the batter and pour it small cup/tumbler, pour the batter from 5” height from the outward base of the tawa into circle shape. Drizzle oil and roast it both sides till turns crispy. 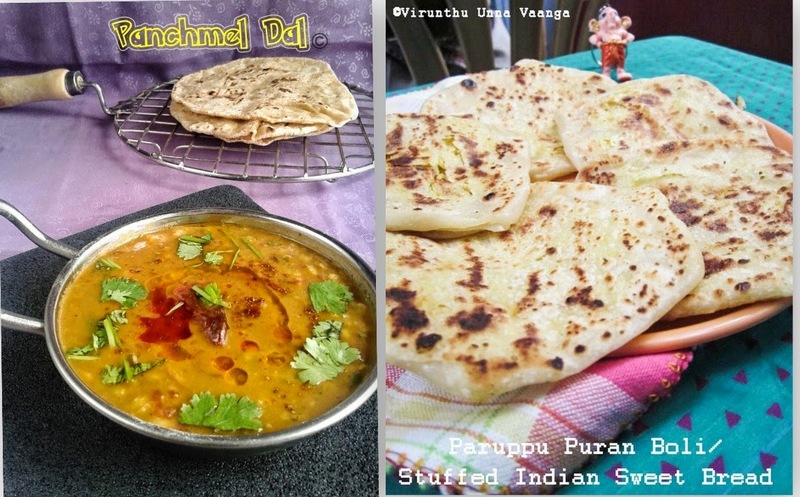 Serve it hot with coconut chutney and sambhar. Stir it every time while pour into the tawa, to avoid settling the batter at the bottom. 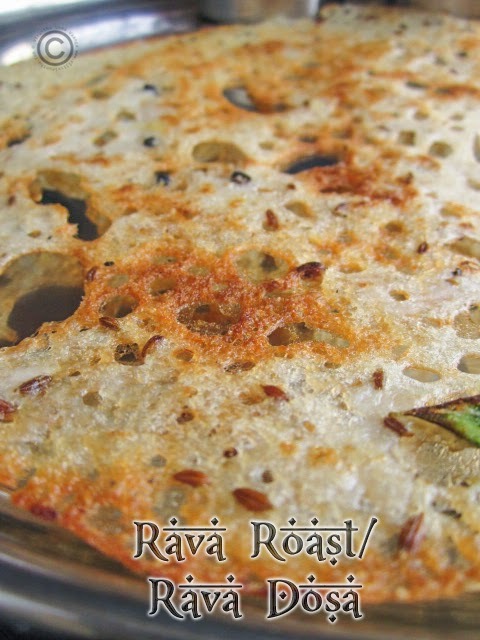 Pour the batter from some height to make gaps in the dosa and it will give crispy texture. Add grated carrot or chopped onion to get other flavour. Resting time is more important to get crispier. If you are having any leftover keep it in refrigerator and use it as you need. 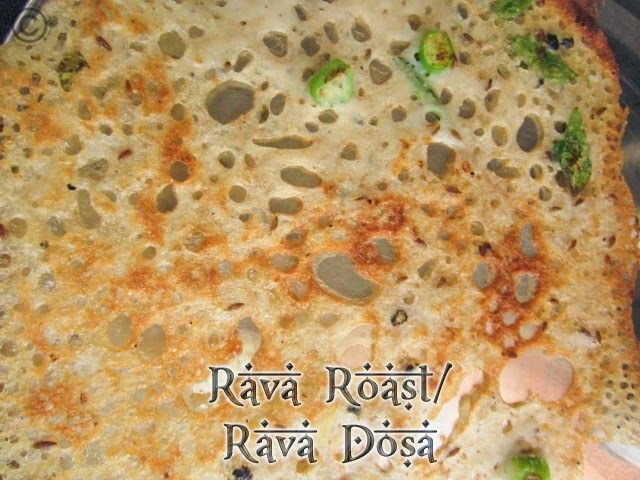 looking very crispy.. Nice dosa.. Going to make this soon. 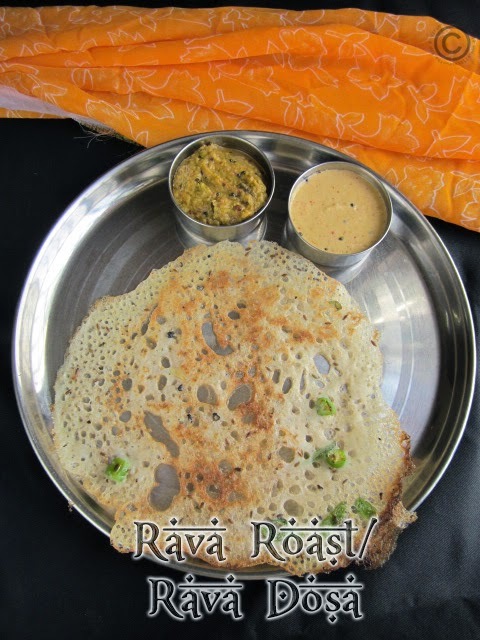 Love rava dosa. Never had it this way. I tried it and it was disaster, cause I think you forget to mention curd in it and me also didn't add it. Left it for two hours but all was in garbage. Next time add it curd and turn out great. Thanks for your comment. 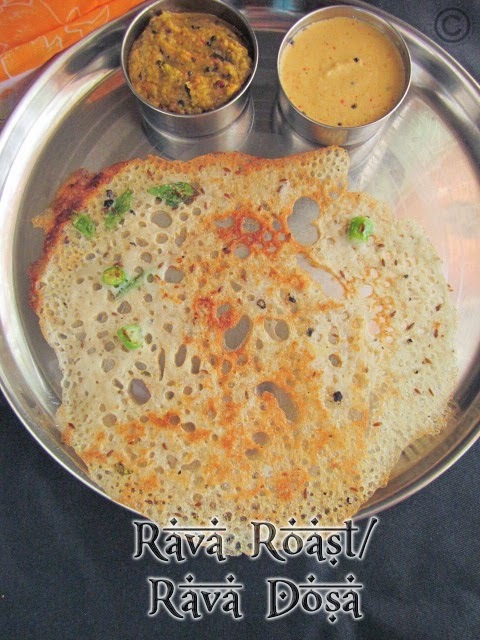 Preferably use cast iron dosa pan to get crisp texture and high heat of the pan is important to get crispy and pour batter from height so that it makes good pores and drizzle oil over it... Hope it helps you to get crispy dosa. Resting time is important before prepare dosa.